Spacious 3BR/2BA Ocean and Mountain Views, Great Location! This spacious 1145 sq. ft. two bedroom and a loft bedroom, two bathroom condo offers panoramic views of the ocean, neighboring islands and the mountain! The master bedroom has it's own private bathroom, and lanai. Watch the whales (in season) and enjoy beautiful sunrises over the mountains and stunning sunsets over the ocean. This condo has a newly renovated full kitchen and is equipped with linens, bath and beach towels, and bedding. The grounds include a pool, hot tub, sauna, tennis courts, and BBQ gas grill areas. Walk to shopping, restaurants, and the best beaches on Maui! 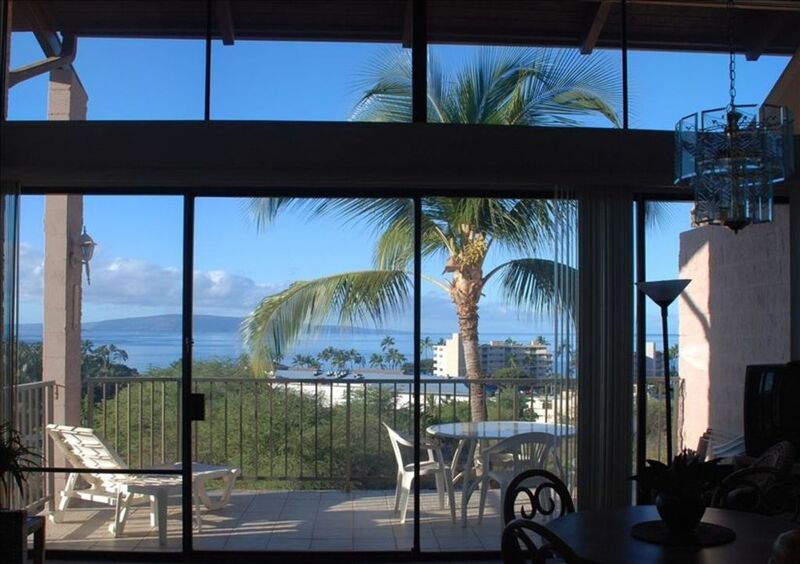 The condo is located within walking distance from Kamaole Beach I, a great snorkeling and swimming beach. Land line with free long distance calls to mainland USA and Canada. There is an elevator in the upper parking lot. There are no stairs from the elevator to the unit. Well stocked pantry with salt and pepper and basic spices and wraps. Tommy Bahama wooden dining table seats up to eight. There is an elevator at the upper parking lot. It is a smaller elevator but a wheelchair can get in. Once at the top floor, 4th floor, there are no stairs to the unit. The unit is not specially fitted for wheelchair access individuals. Everything you need! Everything worked! No glitches! Would go back in a heart beat! The place has a wonderful view and well taken care of. Plenty of outdoor chairs and boogie boards. Lots of towels and the kitchen is well equipped with everything. We came here right before hurricane lane so for a few days we had to stay put but played the games they had in the condo. Had a few bumps along the way but made the best of it. The only thing we didn’t care for was they were paving the parking lot which was just more of a annoyance trying to get around but it’s all done for any one else coming in lol. The condo was in a perfect location and comfortably fit our group of 8. It would have been nice to know that the pool was being repaired so it was non-operational but other than that we had a great time. We recently stayed in this condo and I have to say it did not disappoint. The condo was very well stocked, with everything from linens, beach equipment, cooking utensils, spices... you name it, the condo had it! What was really nice was that past tenants had left various items, such as sunblock, cooking oil, lotion, laundry detergent, etc, and that was so very helpful. We in turn left various items, also. That all makes for a very pleasant stay. The condo was very clean and Elisabeth made sure that we were well taken care of and answered any questions very quickly. The only drawback is that the 2nd bedroom gets very hot and really doesn't cool down, and a few of the fans did not work. However, when we mentioned this to Elisabeth, she made sure to explain that air conditioning units were not allowed in the bedrooms on the walkways, and then brought us a brand new fan, which I thought was excellent customer service and showed that she really cared about her tenants! The view from the condo is absolutely perfect! There were plenty of chairs on the lanai. There was even an umbrella we had found in the closet that we were able to use to block some of the afternoon sun, which made it even better! The man who we saw every day taking care of the grounds was also very pleasant, though we didn't catch his name. We would have loved to swim in the pool but it was closed for renovations. From the looks of it, it will turn out beautiful, and we can't wait to see it in future. Overall, we had a great stay, and I would definitely not hesitate to recommend this condo and will definitely stay again. Thanks again Elisabeth.....we appreciate everything you did to make our stay perfect! We had a wonderful stay. The upstairs loft was perfect for our four boys (ages 6-15). They had their own space to rest and relax after spending our mornings down at Kam 3. We didn’t have any issues with the AC that were referenced in other reviews and most mornings had the kids complaining it was too cold. It was great having the two bedrooms and bathrooms for both families to use. We enjoyed the community grilling area and book sharing library but didn’t use the pool. The condo was in a great location and we highly recommend it for families. Good location! Clean ! Perfect kitchenware and accessories! Good location. Clean. Very good neighborhood and beach! Good kitchenware. A lot bath and beach towels! The third bedroom, is actually loft, no wall. The only problem, small bedroom has no conditioner,was very hot day and night.